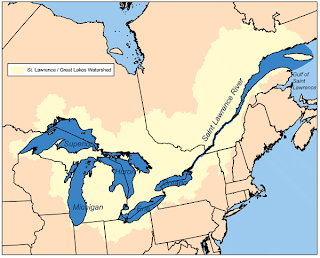 This week, we tell about the biggest system of freshwater lakes in the world, the Great Lakes between the United States and Canada. They are busy shipping paths. They are also known for fierce and deadly storms. Today, we tell about the lakes and some famous shipwrecks.Even before European explorers first saw the Great Lakes, they provided Native Americans with a way to transport goods. Probably the first European to see and explore the Great Lakes was Frenchman Etienne Brule in the early 1600s. He lived among the Huron Indians. All but one of the Great Lakes has a name from Native American languages: Michigan, Huron, Erie and Ontario. The biggest lake, Superior, was named by the French. But the Ojibwe Indians knew it as Gitchigumi, or "big water." Vessels on the Great Lakes are not called ships, but boats. However, boats on the lakes can be huge. The newest of the lake freighters is over 300 meters long. The Griffin was the one of the first sailing vessels on the Great Lakes and also among the first shipwrecks. French explorer and trader Rene-Robert Cavelier De La Salle, built it in 1679. The boat set sail from an island in northern Lake Michigan. La Salle reached what is now Green Bay, Wisconsin. He sent the boat back home with a load of animal fur. No one ever saw the Griffin again. The loss of the Griffin established a long tradition of danger and mystery linked to Great Lakes travel. In the 1840s, iron ore was discovered in the Marquette Mountains in the Upper Peninsula of Michigan. Iron ore, the main raw material of steel, changed the lakes area and the nation. 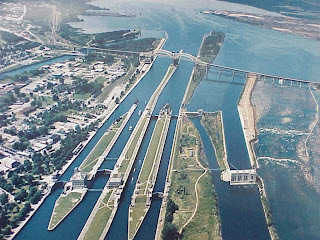 In 1855, the first canal connecting Lake Superior with Lake Huron was completed at Sault Ste. Marie, Michigan. The Soo Locks linked iron mines near Lake Superior with the cities of Detroit, Michigan; Cleveland, Ohio and Chicago, Illinois. 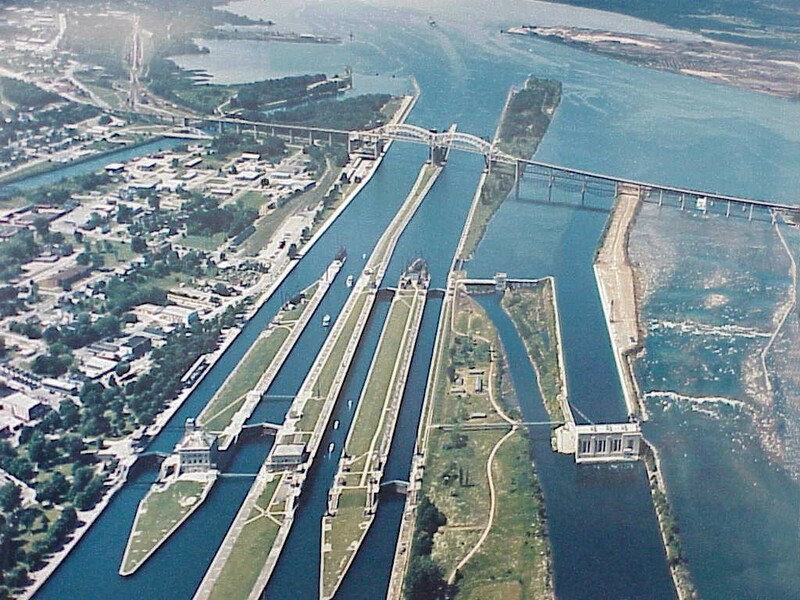 Today, the Soo Locks are the world's busiest. Passenger travel also grew on the Great Lakes. Big steamboats carried hundreds of people between cities. But the threat of fire came with the new steam technology. The worst fire disaster happened on Lake Erie in 1850. The G.P. Griffith was traveling from Buffalo, New York to Chicago with about 300 men, women and children. Many were immigrants from England, Ireland and Germany. Not far east of Cleveland, a fire broke out. As the flames spread, passengers and crew panicked. More than a 100 people jumped into the lake and drowned. Others burned. Only a few strong swimmers survived. But not a single child and only one woman was saved.With thousands of boats on the lakes, collisions became a real danger. The deadliest took place in 1860 in southern Lake Michigan. The steamer Lady Elgin was carrying passengers from Milwaukee, Wisconsin to Chicago to hear a speech by Democratic presidential candidate Stephen Douglas. As many as five to six hundred people were on board, many of Irish ancestry. Northwestern University student Edward Spencer was another hero. He swam from shore and rescued 17 people. The wreck of the Lady Elgin remains the worst loss of life on open water in the Great Lakes. Recent studies say 400 or more people died that night. The worst weather disaster on the lakes happened in 1913. The early November winds reached hurricane force and caused waves eleven meters high. By the time the storm eased, eight big boats were lost on Lake Huron alone. They included the Canadian freighter James Carruthers which disappeared with twenty-two men. Its wreck has never been found. The storm, sometimes called the "Big Blow," killed more than 250 people. Some of the biggest boats to ever sail the lakes have been lost in sudden November storms. In 1958, the Carl D. Bradley was heading home at the end of the shipping season. It first launched thirty years before. At the time, it was the biggest boat on the Lakes. But during a storm on Lake Michigan, the Bradley split in two. Only two of its crew of thirty-five survived. 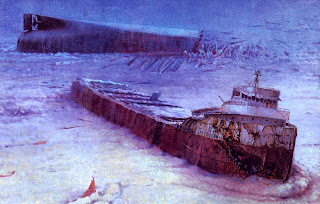 The Edmund Fitzgerald was launched the same year the Bradley sank. The Fitzgerald was 220 meters long. It was the biggest boat on the lakes when it entered service. It would become the most famous shipwreck of all. Canadian folksinger Gordon Lightfoot told the story of the tragedy in "The Wreck of the Edmund Fitzgerald. "On November tenth, 1975, the Fitzgerald was sailing on Lake Superior. It was struggling through a dangerous storm that the old sailors called a "November witch." It had lost its radar and the old lighthouse at Whitefish Point, Michigan was not operating. 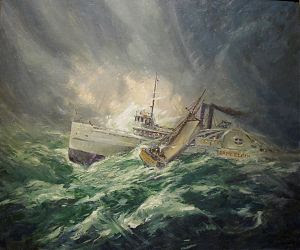 Captain Ernest McSorley radioed another freighter, the Arthur Anderson, that his boat was taking on water. He was making for the safety of Whitefish Bay. But that night the weather got worse. The Anderson reported winds of about 140 kilometers an hour and waves ten meters high. Captain McSorley told the Anderson: "We are holding our own." But that was the last anyone heard from the Edmund Fitzgerald. The boat and twenty-nine men disappeared into Lake Superior minutes later.Tom Farnquist is executive director of the Great Lakes Historical Shipwreck Society. In 1995, he was part of an effort to recover the Fitzgerald's bell. The bronze bell is now preserved at the Great Lakes Shipwreck Museum at Whitefish Point, Michigan. Each year on November tenth, a ceremony is held there to remember the crew members of the Fitzgerald. TOM FARNQUIST: "The lakes are very treacherous. 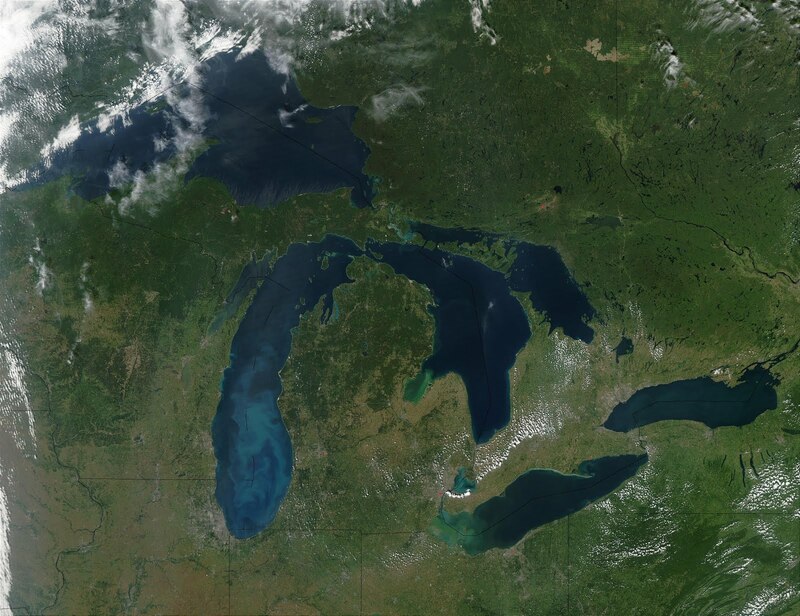 There's over 6,000 and some estimate as high as anywhere to ten to twelve thousand shipwrecks on the Great Lakes." Today, thousands of people dive at shipwreck preserves all around the Great Lakes. The Great Lakes Historical Shipwreck Society works to preserve and explain the history and importance of the area's wrecks. The group was established in 1978. It has grown to over 1,700 members. TOM FARNQUIST: "It's quite a cross-section of American maritime history frozen in time on the Great Lakes. There's probably the best selection of shipwrecks anywhere in the world waiting to be found in Lake Superior. "This program was written and produced by Mario Ritter. I'm Steve Ember. And I'm Barbara Klein. Transcripts, MP3s and podcasts of our programs are at voaspecialenglish.com. 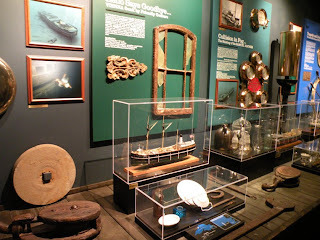 You can also find a link to the Great Lakes Shipwreck Museum. Join us again next week for Explorations in VOA Special English.